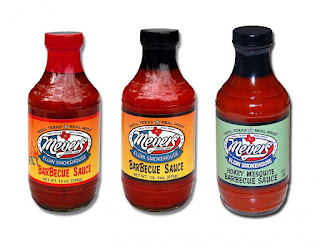 Though known throughout Texas for their slow smoked meats, Meyer's Elgin Smokehouse also produces a fine line of sauces and seasonings to compliment their BBQ. Their products are rooted in Texas tradition, but display a bit of creativity with mixing flavors as well. Meyer's Honey Mesquite Barbecue Sauce is a prime example of tinkering with a tried and true Texas recipe to yield a unique flavor. Meyer's Elgin Smokehouse's Honey Mesquite starts with their original Barbecue Sauce recipe and adds real honey and natural mesquite smoke giving the sauce a great deal more depth and complexity. Like the original, Honey Mesquite is burnt orange (almost red) and on the thinner side. It too is packaged in 19 oz. glass bottles. The sauce has a ketchup base and the ketchup flavor really stands out initially. It also has a fair amount of coarsely ground black pepper that breaks up the sweet and salty elements. The honey accent is noticeable if you're looking for it, but it's very slight. The mesquite flavor, however, comes across loud and clear in the sauce's finish. I used Honey Mesquite on pork spare ribs for our Father's Day BBQ. I would characterize it as a mild sauce making it a safe choice for a wide range of people. The sauce may be a little thin to be an ideal rib glaze, but it stuck to the meat adequately enough. The smooth texture and bright color also made the ribs look pretty appetizing. It didn't quite give the bones that high gloss shine that I typically shoot for, but they still made a good backyard presentation. I've since use the sauce on left-over pulled pork and brisket. It works well when heated and poured over the meat. It's just the right texture for drizzling over a pulled pork sandwich. Meyer's Honey Mequite is a safe, versatile sauce with a mild flavor profile that most people will find appealing. The medium / thin texture allows the sauce to be used for nearly any application. However, I find it best served on top of pork. See how the sauce rates on our "Product Reviews" page and be sure to check out Meyer's website to see their entire product lineup. 2 Response to "Meyer's Elgin Smokehouse Honey Mesquite BBQ Sauce"
Good to know about the Meyer's Elgin Smokehouse Honey Mesquite BBQ Sauce. I will try it must to see the taste of these Sauces. I tried a lot of the Sauces and these are looking a perfect choice.I read and tried recipes from bbqonmain and their taste is so good.